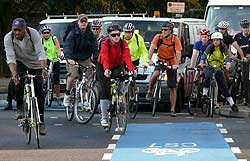 Did the latest tube strike this sunny morning bring out more cyclists? I can't really judge, as I'm not normally out at this time, what with the terms of the ASBO and the electronic tag and everything. Actually, the Northern Line - which the blue stripe of the CS7 follows (right) - was working this morning (though with 'some stations closed'). I couldn't work out the implications of this for modal share though. I was too keen on coming back for breakfast. Lots more bikes on my regular commute this morning but only in zone 2 & 1. Still not many out in zone 3 & 4. Speaking for the North-East I can vouch that numbers were up between Wanstead and Stratford on the edges of zones 3 & 4. Plenty of squeaky chains and not a small number of smiles too. It certainly brought out more boris bikes - according to the visualisation at one point there were 1129 out of their docks and wobbling around London. And I was one of them ... (My folding bike will arrive in time for the next strike). Got my first verbal from a regular cyclist as well. Well, I say regular. It was some kind of humanoid in lycra form. And in case any of you are wondering what the 'visualisation' is that John refers to, it's statsman Oliver O'Brien's whizzy Google map that uses real-time TfL data to show the status of bike hire docking stations. Blue means empty, red full. And a massive 1304 boris bikes were out at one point in the evening. I certainly saw a lot - and was also on one at one point from Hyde Park Corner back to Marylebone station. 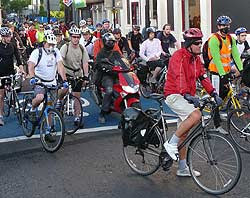 The volume of cyclists and all other road traffic as well seemed massively higher than normal. Quite a lot of people at work disappointed they couldn't just pick up a boris bike - and I did see someone who clearly could afford a day's hire who had sneakily locked their's out of the way until the evening. What did I learn from this image? 1. All cyclists in London are men. 2. They are all between 20 and 50 years old. 3. Most wear macho helmets to show how tough they are. 4. TfL promotional videos don't work. On point 3 I think the opposite. If they're wearing a helmet they're scared.